Kevin Fell and Derek Thorne from HOZA will bring an interactive performance entitled, Peace of a Decade, to Holy Name on Friday, February 15. Presentations will take place at 1:10 – 2:10 for grades K-3 and at 2:20-3:30 for grades 3/4 –8 in the gym. 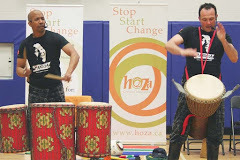 Kindergarten to grade 8 will participate in ... Continue reading "HOZA Performance in Celebration of Black History Month"